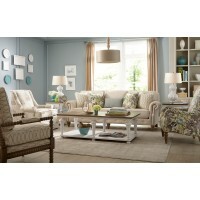 The perfect combination of southern style and comfort, this generously scaled sofa has a lot to love! At 101" long and featuring box border, loose back pillows-there's plenty of room to stretch out and relax. Classic turned legs, down-blean seat cushions and five accent pillows complete this beautiful and truly comfortable sofa.